It's been a rough first year for Banner and Co. The dialogue from local sports scribes these last few weeks has centered on whether or not the Browns are better than last year. Remember that relaxing bye week we had in early November? Cleveland had just beaten the champs and a glorious season of seven or eight wins seemed possible. A month later and the team is staring at the possibility of not even matching last year's five-win total, a song so part and parcel of Browns' fandom that we should be collecting royalty checks. Comparing the 2012 and 2013 seasons is like choosing what strain of herpes you'd rather contract. Even the numbers are basically the same: As compiled by The Plain Dealer, last year's team finished 25th in the league in points; this year's offense is actually worse in that rather important category, ranking 27th before yesterday's washout against the Jets. The 2013 Browns are giving up more points this season, too, standing at 21st in the NFL as compared to a 19th-place finish last year. "The Browns now are the second franchise in NFL history to lose 10 games in 10-of-11 seasons. The last was the Tampa Bay Bucs, who lost at least 10 games 12 seasons in a row from 1983 through 1994." Well, whatever. Not even the gravitas of the late NFL Films guy could make either season look good. The Browns were awful last year and they are putrid this year. 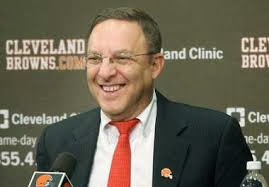 In a week Cleveland fans will be - heaven suffer the little children - turning their aching eyes to the NFL draft. "Change the culture of the organization, change the work ethic, the attitude and the optimism," Banner said. "It’s important to see the team play hard, no matter what happens. We want to see the young players make progress as the season goes on." After a surprising 3-2 start to the year, the culture is right back to where it's always been. Lack of talent is one thing, but the Browns did nothing of significance to improve the running back position after trading Trent Richardson. Nor did this star-crossed franchise seek a quarterback after Brian Hoyer blew out his knee. Even an admittedly risky pickup like Josh Freeman, now an afterthought with the Vikings, would have been a better option than running Brandon Weeden out there. It's just hard to plug in a scheme when you don't have the players to do it. Meanwhile, a defense that once looked stout and aggressive now seems tired, giving up leads as well as swaths of yardage to opposing skill position players. Point is, the systems in place once again feel fatally flawed, while the Browns' evident talent deficit likely means another roster overhaul heading into 2014. Two supposed core players - center Alex Mack and safety T.J. Ward - will become free agents this off-season, possibly giving the franchise even more gaps to fill. It's difficult being optimistic about the state of the Browns' union considering its profound and depressing regression over the last two months. The roster does have one or two game-changing players as opposed to previous years, but that's just a testament to how poor past leadership has been at selecting talent, not some bright beacon illuminating future success. Sooner or later, the wins will have to come, and all the business-speak buzzwords fans hate will be shunted to the side. It's no fun taking a microscope to two seasons of bad football to figure out which one sucked less. It's a shame that's what the Browns have relegated us to.